A few months ago, the Wing Dome on Olive & Bellevue closed its doors, and I can’t say that I shed a tear. It was replaced with a more muted, sky blue trimmed restaurant (and bar) called The Saint. Gio introduced Lauren and me to The Saint on election eve. Their tasty margaritas helped our anticipatory nerves. We ate tasty guacamole and chicken mole, all very reasonably priced. Our camera was MIA that night, so dinner pictures will need to wait until next time. 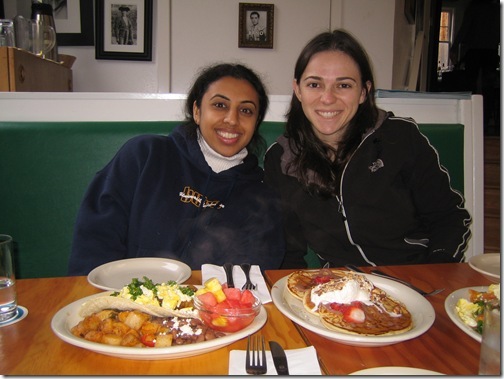 Today we took Vidya to try out The Saint’s brunch. 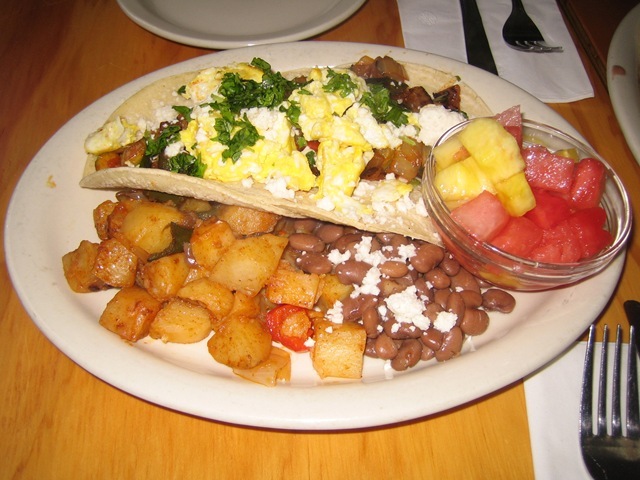 The top dish of the afternoon was Tacos y Heuvos — eggs, grilled vegetables, potatoes, beans, and warm corn tortillas. We also enjoyed hotcakes con crema batida. Three medium density pancakes served with strawberry tequila sauce, almonds, and agave nectar whipped cream. These guys know how to use their tequila! 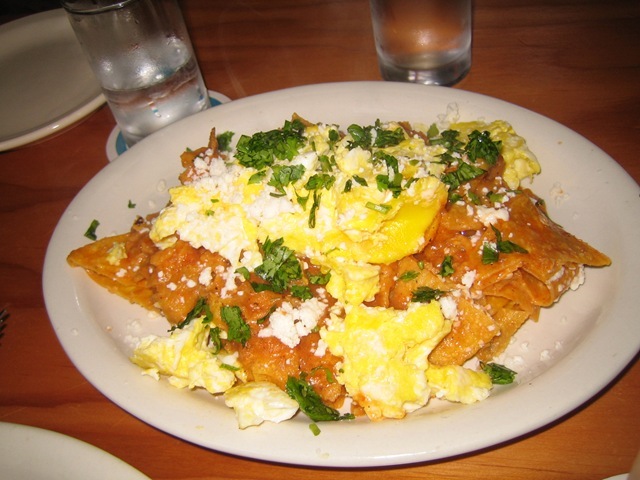 Overall, the food is good, the drinks are great, the interior is cozy, and the staff are very friendly. The Saint is a great addition to Capitol Hill. This entry was posted in Food on November 16, 2008 by kenny. Today was an absolutely beautiful day in Seattle. Sunny, clear, with a light breeze. It felt like September! Lauren and I spent this afternoon supporting equal rights on a march through Seattle. After the march, we headed to a late lunch at the Pink Door. The Pink Door is located in Pike’s Place Market, down Post Alley (across from Kell’s) behind an inconspicuous salmon-colored door. Within is a large indoor area, but the highlight (especially on a day like today) is the large outdoor deck. We were seated outside, with panoramic views of the Market and Puget Sound. We started with a cheese board plate. 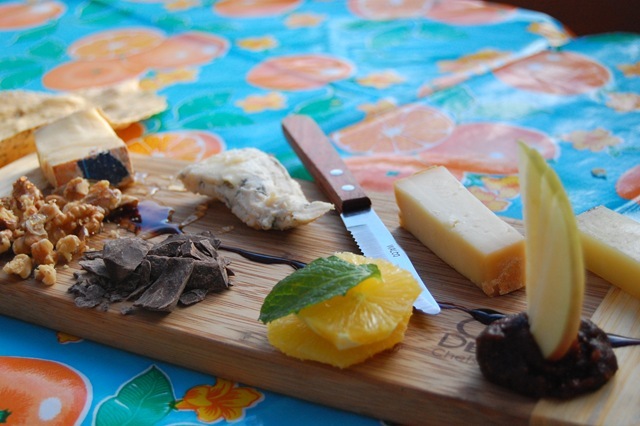 Each cheese was paired with a complementary item (walnuts for the tellagio, chocolate for the bleu, oranges for the sheep’s milk, and a fig jam for the pecorino). All were good pairings, though the first two were stand-outs. A great and generously sized start to the meal. Lauren ordered the paglia e fieno “straw and hay”. 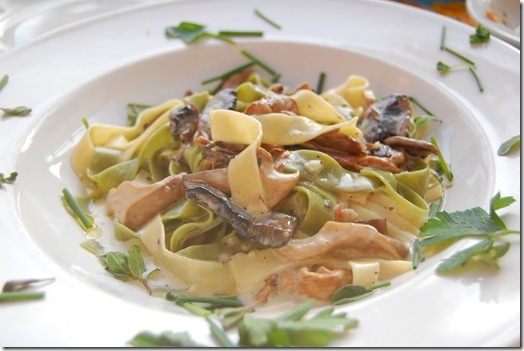 This was a mix of white & green fresh fettuccine with wild mushrooms and fresh herbs tossed in a light cream sauce. This is the perfect season for mushrooms, and it was my favorite of the dishes I tried. 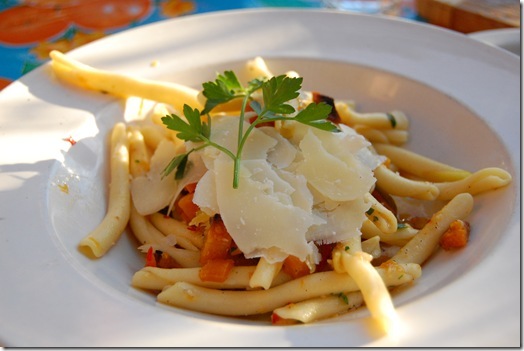 I had the "strozapreti di zucca" – pasta with leeks, pumpkin, and pecorino cheese. I liked the pumpkin and cheese, but overall the dish was lacking when compared to the straw and hay. Our friends ordered the chicken pannini, lasagna, and pappardelle with meat sauce which all looked good. This entry was posted in Food on November 15, 2008 by kenny.